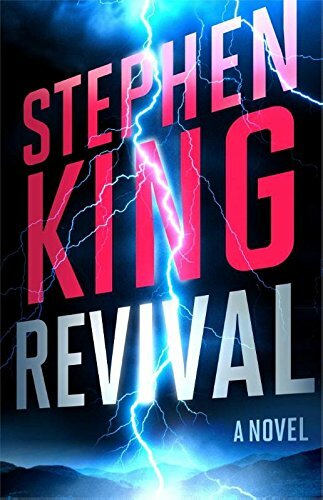 Stephen King, one of the most influential authors of modern time, returns to his roots of paranormal horror with the bone-chilling Revival. King cites Mary Shelley’s Frankenstein and the Arthur Machen short story “The Great God Pan” as inspiring this novel. They explore two themes: life and afterlife: a scientist, scarred by personal tragedy madly tries to smash the boundary between life and death with terrible consequences to follow, also fearing that the afterlife is filled with inescapable horrors that can influence the real world. This haunting couplet could be spun into many meanings, none of them pretty. King’s interpretation is soul crushing. Some doors are best kept locked, but characters in horror stories are just can’t help themselves. Revival follows Jamie Morton from his boyhood in rural Maine (a familiar setting for King readers), through his young adult years as a drug-addicted guitarist in cover bands, to his mature years running a recording studio. Every time his life takes a dramatic turn, Charles Jacobs is there. Morton calls Jacobs his “fifth business,” a change agent that shows up out of the blue after many years and shakes up his life. Jacobs starts as a positive influence when he meets six-year-old Morton in 1962 as the new preacher in town who’s kind to the child. King foreshadows their relationship, with the young preacher’s shadow looming over the child—a shadow he could never escape. Jacobs is equal parts charismatic and enigmatic. He charms the small community and has Morton and his siblings play in his home with his wife and little boy. Jacobs conducts mysterious experiments with electricity that fascinate the boy. When Jamie’s older brother Conrad goes mute after an accident, Jacobs cures him with a makeshift electrical device. The preacher says it was a trick; that Conrad was playing mute after his injury healed because he was nervous. Morton buys it, for the time being. Tragedy sets Jacobs on his maniacal course. The preacher’s wife and boy die in an automobile accident. Then he delivers the “Horrible Sermon” to his congregation. In most cases it would be easy to forgive a person for giving an offensive speech so soon after losing loved ones. How could a congregation fire a preacher only weeks after he lost his wife and son? Jacobs crosses the boundaries so far, basically calling religion a hoax and a waste of time, that the community has little choice. Decades later, they meet again. Jacobs is a big-time preacher who runs tent-show healings that attract thousands. His electrical powers really do heal the sick, but a select few of them quickly turn for the worst, going mental or becoming violent. Morton tries to confront him, but that shadow still looms over him. He knows Jacobs is working toward a bigger goal, a door to the world beyond that should never be unlocked. Morton must choose between stopping him or reluctantly cooperating so he can get a glimpse at what’s on the other side. King wrote a worthy tribute to his icons of horror.